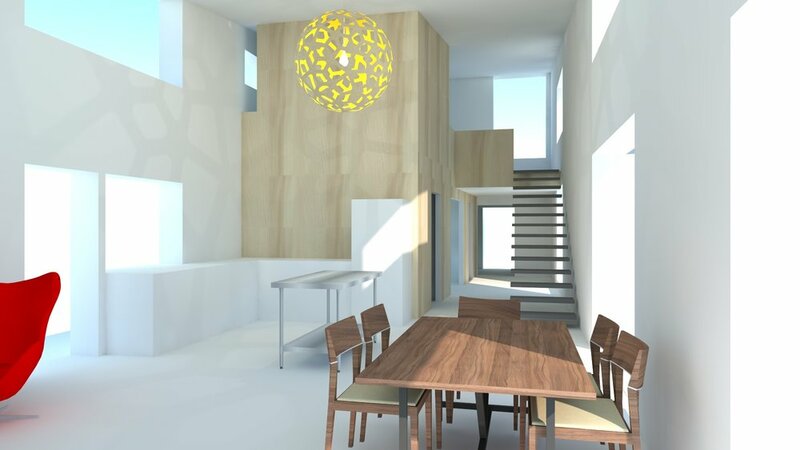 Design Process - a super high performance, compact, modern house in Rural Vermont — Vermont Architect. 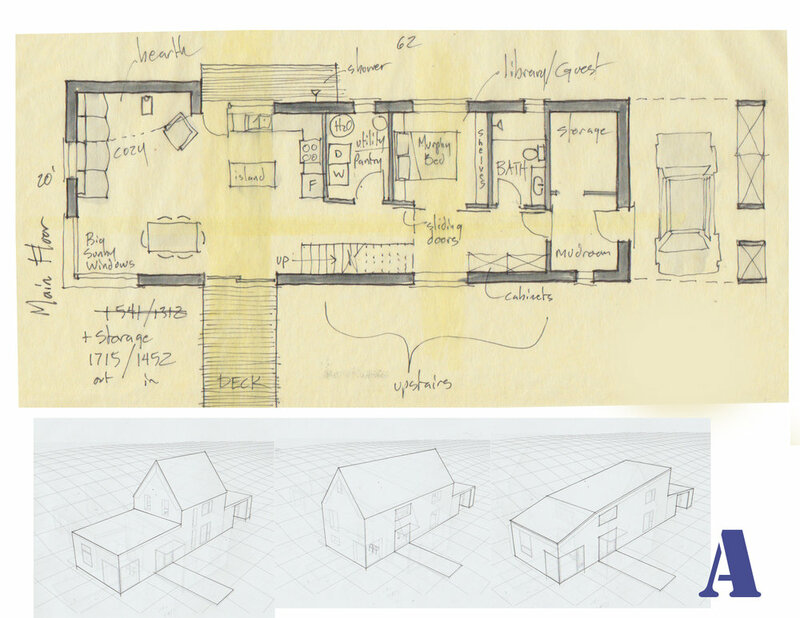 Some of the Building Science (and best practice) diagrams that are part of high performance home design. I am working on several awesome and excellent projects with several awesome and excellent clients and several awesome and excellent builders. Here, I will go over the process to date on one of them. It occurred to me that I am truly a design architect. In architecture school they tell you that only a small percentage of us will be able to call ourselves design architects. The rest will get pigeonholed into specialties within larger firms or flee architecture altogether. With this project, I am pushing my own envelope a fair amount. 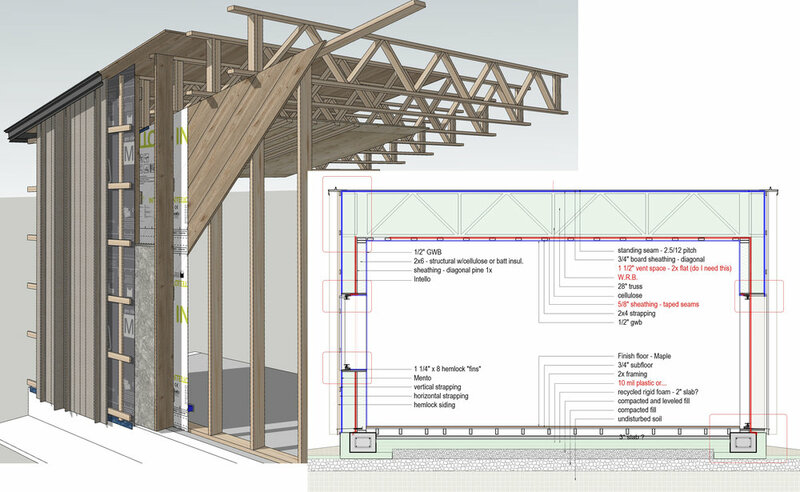 I am trained as a Passive House Designer and this project may be headed toward certification. A goal is to create detailing such that the difference between Code Minimum (who wants that?) (sneer), Pretty Good House (click the link) and Passive house, is only a matter of cellulose insulation so to speak. How much can I simplify? There is an inherently modernist approach in the notion of simplification. It relates to construction methodology as well as aesthetics and function. Another idea that I have been increasingly exploring is hyper-localization. This relates to such things as embodied energy and carbon debt and represents a deeper level of green than you typically see in this industry. 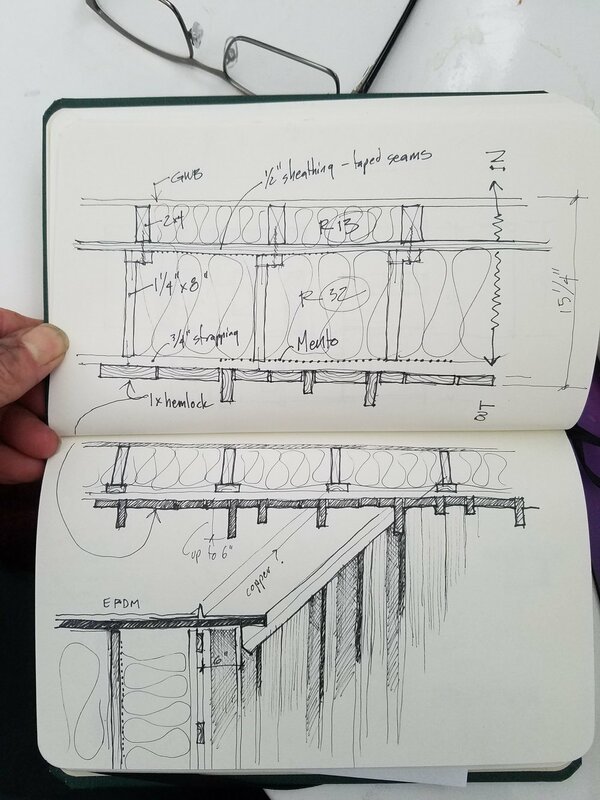 There are relationships with the natural building world as well which is going strong in Vermont but as I see it, more with the notion of beauty of materials and less the poetry of space. In this case, how much local material can I use? Are there alternatives to business as usual that incorporate locally produced, less processed materials that end up being less expensive and more durable and meet the aesthetic and functional goals? I am committed to finding ways to work with the local lumber mills for instance. Can I use wood from 5 miles down the road instead of the lumber yard? What are alternatives to processed wood such as LVLs and TrussJoists? What is the embodied energy content of what goes into these buildings and how can I mitigate that through design? I started thinking along these lines will attending AIACran in Cincinnati this fall. I had an upcoming potential project and the Client, the site and the possibilities had really captured my imagination. I was in a talk by Sebastian Schmaling of Johsnsen Schmaling Architects and they were showing pictures of the Pleated House. The house itself was super nice but what hit me was the sense of poetry that guided the design process. I realized that that was how I think and it always has been and it was time to stop hiding from it. My clients and my builders are ready for poetry. They can handle it. People come to me because they want something they are not finding even in the glossy websites from the prefab companies. The following images are a few of the early planning efforts and a latter one. These images illustrate a thought process that results in an overall simplification. My observation is that few designers or architects follow this process through to a thorough level. When they achieve “good enough” it’s good enough and they stop there. This costs more money in the long run and results in a less developed and cohesive project. This is what I try to move well beyond. 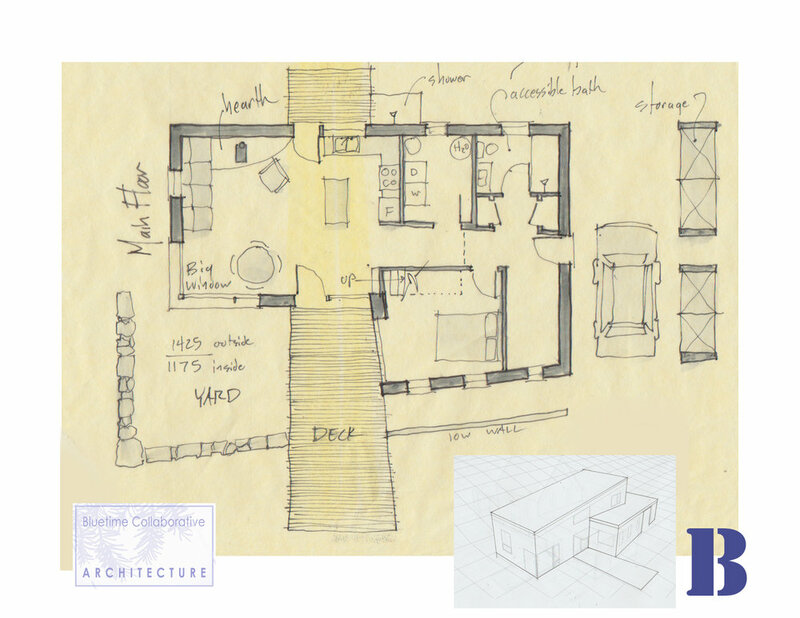 Early in the design process I work up some fairly detailed construction ideas in conjunction with the builder. This helps me identify areas I can simplify in the construction sequence as well as what inherent possibilities the method of construction might create. An early rendering reveals much about the overall attitude of the project. This image, though far from the final form, tells me much about how a building might want to be a part of this forest. The overall sense is humble and protective rather than something more upright and “house-y” I am modifying a siding detail that I have used with success in the past which is “green” hemlock form a local mill. It can be installed with simple deck screws in a rainscreen fashion. In the past I have used narrow hemlock installed horizontally. In this forest there is a strong vertical element of the trees which spring from the rolling landforms. 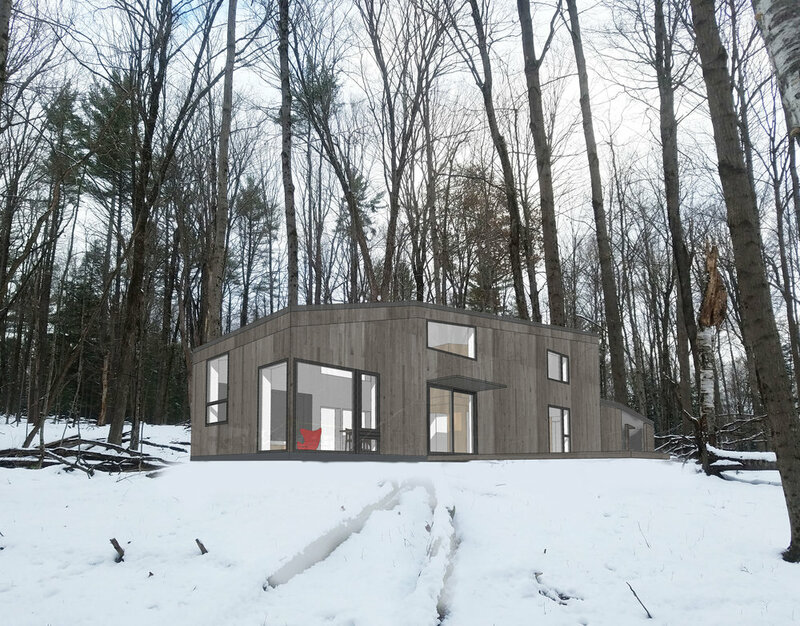 I will use the hemlock siding in both vertical and horizontal form sin a fairly unique (stay tuned) way that will hopefully relate much more to the surrounding forest than more traditional (and expensive) forms of siding. This is in contrast to the effect I was going for in the interior. I was trying to create a chapel of light in the forest. A simple and beautiful uplifting space. I continued to develop both the interior spaces and exterior form. I was looking for a sense of warmth and cozy-up-to-the-fire comfort. At the same time as an uplifting and opening sense of space that makes the occupant feel healthy and awake. I did a series of interior images to help me tune those ideas. There is a bit of Alvar Aalto going on here. I am currently working on the Construction Drawings. This is, again a process of simplification. It is also a process of being super ridiculously picky and fine tuning to a level that nobody but me cares about. 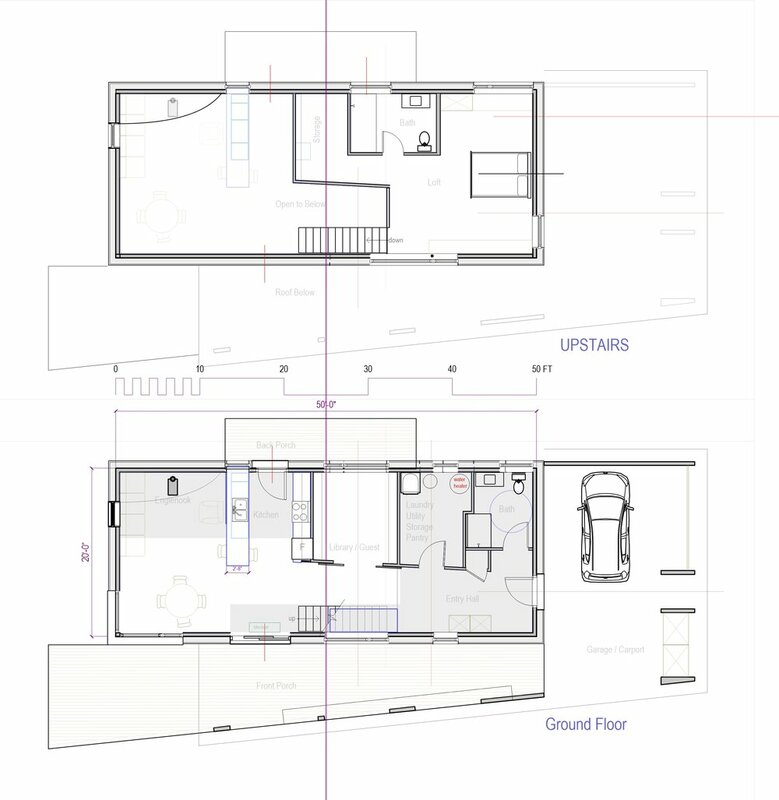 I will put notes into the construction drawings to clarify design intent which will help the contractor identify extra important things such as alignments, intents and other aesthetic goals. This helps them on a day to day basis when actually building this house to understand decisions made moths ago. When they call me on the phone or I visit the site during construction, the builder’s questions can be on a much higher level than otherwise. A big goal is to to get the builder as excited about the project as I am and the client is.